Sometimes people find themselves in need of a major smile overhaul. Perhaps you haven’t kept up with routine dental visits and home hygiene the way you should. Maybe you are genetically predisposed to periodontal disease and it has caused you to lose one or more of your teeth. The professionals at the Anderson SC dentist office of Dr. Brent Copeland are not here to judge. We are here to get you back on the path of favorable oral health through restorative dentistry. Restorative dentistry is the term we give to describe dental treatments that help ensure your teeth, gums and jaws continue to function properly. Do you avoid certain kinds of foods because you have difficulty chewing them or it causes pain when you chew them? Do you refuse to smile broadly because you don’t want others to see your teeth? Are you missing several teeth? Then restorative dental treatments might be an option for you. Let Dr. Copeland evaluate your teeth, jaws and gums and determine a treatment plan that will best address your specific needs. Crowns – This is a good option if you have a cracked or broken tooth, or a cavity that has grown to the point where simply filling it may compromise the tooth’s structure. We will prep your tooth by reducing it in size enough to make room for a porcelain or ceramic crown that will fit over your natural tooth without creating additional bulk. The crown will have the appearance of neighboring teeth and will provide an aesthetic solution that also enables you to chew properly without pain, discomfort or abnormal enamel wear. 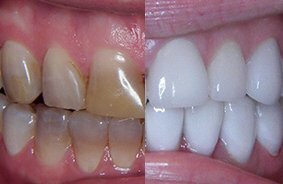 Veneers – These thin sheets of porcelain can be bonded to teeth that have heavy staining, chips, extensive wear, or minor cracks. They also can be used to address unwanted spacing between the teeth. Bridges – A dental bridge is a type of restorative treatment that may be recommended if you are missing several adjacent teeth. We secure the bridge – which contains prosthetic teeth – in place by placing crowns over one healthy tooth on either side of the area of the missing teeth. We also can secure bridges to dental implants. The end result is a restoration that looks natural and enables for you to chew your food properly. Dentures – Dr. Copeland offers full and partial dentures to patients who are missing several or all of their teeth in their upper or lower jaw, or both. We offer conventional dentures as well as those that are held in place by dental implants. Implant-supported dentures tend to offer the greatest stability and comfort. Please call us to schedule a consultation if you have questions about restorative dentistry and wish to learn more about restorative treatments that will improve your smile.